Let me start off by stating that I’m not your typical ‘horse person’. Full disclosure — I’m not even an animal person. I don’t whisper in dogs’ ears or call furry things ‘cute’. But I also don’t run away from four-legged creatures or step on six-legged ones. I respect living things. Now that we’ve established that, let’s talk about the issue of horse-drawn carriages in Victoria. How did they begin? 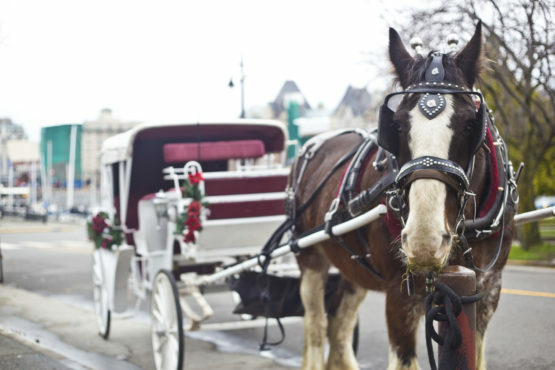 Horse-drawn carriages consist of exactly what you have in mind: a horse and a carriage. More specifically, a roughly seven-hundred pound carriage and a two-thousand pound draught horse, typically a Clydesdale. This ancient form of transportation and current tourist attraction has been part of Victoria’s history for over a hundred years, going all the way back to the city’s beginnings as a colonial fort. In recent years, a decent number of people have united in an effort to ban the carriages, holding signs that read things like ‘Animal Cruelty’ and following the carriages around on their tours, or staying at home on rainy days to type impassioned emails to the SPCA. Truth be told, the specific breed of horse used for the horse and carriage industry was established for agricultural and hauling purposes. Before being involved as a driver in the carriage industry myself, I didn’t have much of an opinion on whether these carriages should be off the streets or not. But after hearing the reasons behind why, especially from younger generations, it just didn’t make sense. The most popular arguments I’ve heard include, horses aren’t meant for the streets, it’s cruel, or something about them being overworked. Based on these (often inaccurate) assumptions, many activists want to shut down the industry entirely. Truth be told, the specific breed of horse used for the horse and carriage industry was established for agricultural and hauling purposes. That is, in the wilderness, these horses would go nuts without something to pull on. So roughly six-hour long shifts, four times per week, these horses are surely not overworked. In fact, draft horses that are put to work for agricultural purposes tend to pull on heavy machinery up to ten hours a day. And again, that’s what they were bred for. Clydesdales are also so sensitive that they depend on humans. Whether it’s cramps or a mild scrape, these horses are constantly monitored by specialized veterinarians. If the carriage tour companies were to shut down, there wouldn’t be money generated to pay for all their expenses. Would individuals adopt the two-thousand-pound alfalfa-eaters, keeping them in their studio apartments? These animals are so expensive to keep healthy that if they generate no income for themselves to be maintained, then most of them would likely have to be put down, or liberated into the wilderness to die. At the end of the day, animals in the wilderness work hard every day to find food, shelter, and survive. Humans work daily jobs to do the same. Draft horses are somewhere in between — and that’s the way it should be.